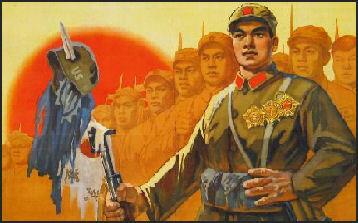 Mao-era foreign imperialist poster There is a widespread belief that "China is not yet a great power by is clearly going to be." A worldwide survey conducted in 2006 by Germany’s Bertelsmann Foundation found that many believe that the United States will lose its position as the undisputed leading power by 2020 as China emerges as a formidable rival. China is already regarded as the dominant military and economic power in Asia not Japan or India. Bob Woodruff of ABC said that China is effectively creating “a new world map with China at its center.” China is everywhere. In former war-torn countries like Angola and Cambodia exploiting oil reserves and labor. It is in Brazil and the United States buying up bumper crops of soy beans and corn. It is hard for any place on earth where cheap Chinese products have made many things formally too expensive cheap enough for the poorest of poor to buy. While the United States under Bush has come across as the unilateral cowboy that acts aggressively to pursue its self interests China has come across as major power that takes into consideration other country’s interests and acts for greater public good. China is aiming to placate worries about the economic threat it presents by building bilateral ties, promoting institutions for regional cooperation, allying itself with both developed countries and developing ones, and taking an active role in international organizations like the United Nations and regional organizations like ASEAN. In the old days China used to abstain a lot in Security Council votes but these days it is much more active in defining policy as well as supporting or rejecting it. But the limits of its reach were clear during after the tsunami disaster when China could only offer modest amounts of money and logistical assistance while the United States and Europe were donating billions of dollars and sending ships, planes, equipment, rescue teams other kinds of assistance. The United States and others have urged China to become “responsible stakeholder in international affairs” and have argued it is in China’s self-interest to do so. Many feel that China is shirking its responsibility as a rising world power by failing to offer much help in tragedies such as the tsunami in south Asia, famines in Africa and the earthquake in Pakistan and pursing a business only strategy in Africa. Debates “particularly in the blogosphere and in newspapers in China” that urge a far faster, more assertive rise, and that trumpet American decline. Bill Emmott of the Times of London theorized that the assertiveness and bluster provides convenient cover as China prepares to carry out unpopular policies to gain control over the economy and prevent a bubble from exploding especially with many of these policies such as possibly raising the value of the yuan being in line with what foreign critics of Chinese policy want China to do. For all the talk of China’s assertiveness it can be very passive at international meeting often acting more like a member of the audience than a participant or leader. It has been very passive on North Korea and when it does take action it acts more of an obstructionist than activist as with Iran. “These Chinese are not alone. A recent poll shows there are more Americans who believe China will be the dominant power in 20 years than believe the United States will retain that position. Some analysts go further and argue that China's rise will result in a clash similar to that between a rising Germany and a hegemonic Britain that led to World War I a century ago. Given that China and the United States face global challenges such as financial stability, cyber security and climate change, the two countries have much to gain from working together. Unfortunately, faulty power assessments have created hubris among some Chinese, and unnecessary fear of decline among some Americans, and these shifts in perception make cooperation difficult. Any American compromise is read in Beijing as confirmation of American weakness. But with more realistic projections and policies, China and America need not repeat the disastrous experience of Germany and Britain a century ago. Joseph S. Nye Jr. is a professor at Harvard's John F. Kennedy School of Government and author of "The Future of Power." 1. China’s rise is marginalizing American influence in Asia . Just the opposite. Certainly, China’s power in Asia is growing; its economy is now the biggest in the region, and China is the largest trading partner for every Asian nation. And its military modernization has made the People’s Liberation Army a more lethal fighting force. But instead of marginalizing or supplanting U.S. influence, China’s expanding power is pushing most Asian countries closer to Washington---and elevating America’s status. Uncle Sam’s presence is still welcome because it prevents a regional power from dominating its neighbors and promotes strategic balance. Today, the more power China gains, the more critical the U.S. commitment to the region becomes, and the greater influence Washington exercises. No surprise, then, that when the Obama administration recently announced a strategic pivot toward Asia, China bristled, while most countries in the region felt reassured and applauded quietly. Today, U.S. security ties with key Asian nations---India, Australia, Japan, Korea and even Vietnam---are better than ever. 2. China’s massive foreign exchange reserves give it huge clout . China owns roughly $2 trillion in U.S. Treasury and mortgage-backed debt and $800 billion in European bonds. These massive holdings may cause anxiety in the West and give Beijing a lot of prestige and bragging rights---but they haven’t afforded China a lot of diplomatic sway. The much-feared scenario of China dumping U.S. sovereign debt on world markets to bend Washington to its will has not materialized---and probably won’t. China’s sovereign wealth fund, which invests part of those reserves, has favored low-risk assets (such as a recent minority stake in a British water utility) and has sought to avoid geopolitical controversy. And in the European debt crisis, China has been conspicuously absent. China’s hard currency hoard adds little punch to its geopolitical power because its stockpile results from a growth strategy that relies on an undervalued currency to keep exports competitive. If China threatens to reduce its investment in U.S. debt, it will either have to find alternative investments (not an easy task these days) or export less to the United States (not a good idea for Chinese manufacturers). Moreover, with so much invested in Western debt, China would suffer disastrous capital losses if it spooked financial markets. 3. The Communist Party controls China’s Internet. In spite of its huge investments in technology and manpower, the Communist Party is having a hard time taming China’s vibrant cyberspace. While China’s Internet-filtering technology is more sophisticated and its regulations more onerous than those of other authoritarian regimes, the growth of the nation’s online population (now surpassing 500 million) and technological advances (such as Twitter-style microblogs) have made censorship largely ineffective. The government constantly plays catch-up; its latest effort is to force microbloggers to register with real names. Such regulations often prove too costly to enforce, even for a one-party regime. At most, the party can selectively censor what it deems “sensitive” after the fact. Whenever there is breaking news---a corruption scandal, a serious public safety incident or a big anti-government demonstration---the Internet is quickly filled with coverage and searing criticisms of the government. By the time the censors restore some control, the political damage is done. Already in 2007, Hu told the 17th Congress of the Chinese Communist Party that China needed to invest more in its soft power resources. Accordingly, China is spending billions of dollars on a charm offensive. The Chinese style emphasizes high-profile gestures, such as rebuilding the Cambodian Parliament or Mozambique’s Foreign Affairs Ministry. The elaborately staged 2008 Beijing Olympics enhanced China’s reputation, and the 2010 Shanghai Expo attracted more than 70 million visitors. The Boao Forum for Asia on Hainan Island attracts nearly 2,000 Asian politicians and business leaders to what is billed as an “Asian Davos.” And Chinese aid programs to Africa and Latin America are not limited by the institutional or human rights concerns that constrain Western aid. China has always had an attractive traditional culture, and now it has created several hundred Confucius Institutes around the world to teach its language and culture. The enrollment of foreign students in China has increased from 36,000 a decade ago to at least 240,000 in 2010, and while the Voice of America was cutting its Chinese broadcasts, China Radio International was increasing its broadcasts in English to 24 hours a day. In 2009, Beijing announced plans to spend billions of dollars to develop global media giants to compete with Bloomberg, Time Warner and Viacom. China invested $8.9 billion in external publicity work, including a 24-hour Xinhua cable news channel designed to imitate Al Jazeera. Beijing has also raised defenses. It limits foreign films to only 20 per year, subsidizes Chinese companies creating cultural products, and has restricted Chinese television shows that are imitations of Western entertainment programs. What China seems not to appreciate is that using culture and narrative to create soft power is not easy when they are inconsistent with domestic realities. The 2008 Olympics were a success, but shortly afterwards, China’s domestic crackdown in Tibet and Xianjiang, and on human rights activists, undercut its soft power gains. The Shanghai Expo was also a great success, but was followed by the jailing of the Nobel peace laureate Liu Xiaobo and the artist Ai Weiwei. And for all the efforts to turn Xinhua and China Central Television into competitors for CNN and the BBC, there is little international audience for brittle propaganda. Now, in the aftermath of the Middle East revolutions, China is clamping down on the Internet and jailing human rights lawyers, once again torpedoing its soft power campaign. As Han Han, a novelist and popular blogger, argued in December, “the restriction on cultural activities makes it impossible for China to influence literature and cinema on a global basis or for us culturati to raise our heads up proud.” The development of soft power need not be a zero sum game. All countries can gain from finding attraction in one anothers’ cultures. But for China to succeed, it will need to unleash the talents of its civil society. Unfortunately, that does not seem about to happen soon. The Chinese Communist Party remains a tiger that will bite. For working on human rights with Liu Xiaobo, after he was awarded the Nobel Prize, I was tortured by the country’s secret police and nearly lost my life. Since then, dozens of lawyers and writers have been subjected to brutal torture; some contracted severe pneumonia after being held in front of fans blowing cold air and then being baked by an electric furnace. The secret police threatened me, saying that they had a list of 200 anticommunist party intellectuals whom they were ready to arrest and bury alive. Over the past year, the number of political prisoners in China has increased, and the jail sentences have become longer---yet Western voices of protest have become weaker. Harsh internal repression and unrestrained external expansion are two sides of the same coin. The Chinese Communist Party recently vetoed the U.N. Security Council’s resolution on Syria because killings not unlike those committed by Damascus continue in Tibet. More than a century ago, Westerners described China as a “sleeping lion”; today, it is the West that has fallen asleep. As an independent writer and a Christian member of a “house church,” I have the responsibility to tell the truth: The Chinese Communist Party is still a man-eating tiger.